JUBA (AFP) - The two Sudans must strike an urgent compromise deal to end bitter disputes and resume oil production, United States (US) Secretary of State Hillary Clinton said on Friday, warning the newly separated nations that they "remain inextricably linked". 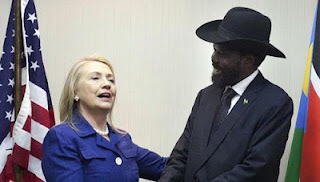 Sudan and South Sudan "will need to compromise to close the remaining gaps between them", Mrs Clinton said, after meeting South Sudan's President Salva Kiir. "It is urgent that both sides, north and south, follow through and reach timely agreements on all outstanding issues, including oil revenue sharing, security, citizenship and border demarcation," she added. Mrs Clinton, the most senior US official to visit since South Sudan's independence in 2011, highlighted Washington's concern over the bitter dispute between Juba and Khartoum.